Managment was great they treated ne like a person snd were verh good to me. 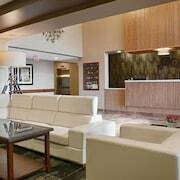 Where to find Lamont hotels near an airport? Where can I find hotels in Lamont that are near tourist attractions? Considering there is just 1 quality accommodation option within a 0.1 kilometres (0.06 miles) of downtown Lamont, it's worth securing a place to stay well before your departure date. There are only a small number accommodation options within an easy walk from the center of Lamont. 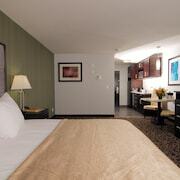 The Heartland Hotel is a good choice as it's just 3 kilometres (2 miles) away. 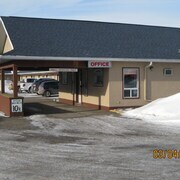 The Heartland Hotel is 0.7 kilometres (0.4 miles) from the middle of Lamont. After you have got a feel for Lamont, why not explore a bit more of the area? The Central Alberta district has many things to offer tourists. Investigate Central Alberta's old towns and archeological sites. Those with a hankering for fresh air and wide open spaces should also make the time to to admire the region's forests. In this region of Canada tourists may partake in snowboarding, skiing and cross-country skiing. Consider spending a few hours enjoying Leduc Golf and Country Club and Maclab Centre for the Performing Arts, in Leduc, 75 kilometres (47 miles) to the southwest of Lamont. 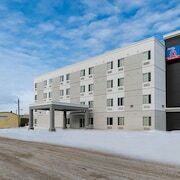 If you'd like to spend a night or two in Leduc, check out the room rates at the Best Western Plus Denham Inn & Suites and Executive Hotel Alexandra. 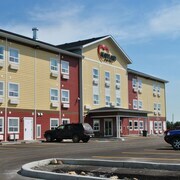 Or, you could stay in St. Albert, 55 kilometres (36 miles) to the west of Lamont, where you can choose from the Best Western Plus The Inn At St. Albert and Sleep Inn Motel. Should you choose to stay in St. Albert, set aside some time to check out the St. Albert Botanic Park and John E. Poole Boardwalk. Just because you're on vacation, doesn't mean you can't enjoy your love of sports. You'll find Rexall Place 50 kilometres (31 miles) to the southwest of Lamont. Those sports fans wishing to find accommodation close to the stadium can choose from the The Fairmont Hotel Macdonald or the Union Bank Inn. Edmonton International Airport is a nearby airport for flying in and out of Lamont. It is 75 kilometres (46 miles) drive away. 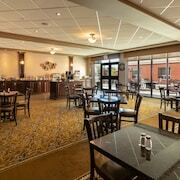 If you plan to stay nearby, try the Ramada Edmonton International Airport or Executive Royal Hotel Edmonton Airport. 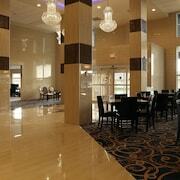 What are the most popular Lamont hotels? Are there hotels in other cities near Lamont? 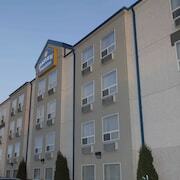 What other types of accommodations are available in Lamont? Explore Lamont with Expedia.ca’s Travel Guides to find the best flights, cars, holiday packages and more!